Five guests stuck at Presby Allen waiting for a CAB at 2:30AM today almost missed their flight to China until Bec N Call came and got them to DFW on time. Randy Hendrickson is the BEST!! I love it when you make my life so easy. All I have to do is email or text you and you always come through for me! I trust my precious cargo with Bec N Call — my daughter! Randy is awesome and so caring and considerate. Randy has always provided excellent care for our pets when we’re away. Scott is so caring and I can tell he truly loves our dog. His compassion shows in his work and the cute little notes he leaves on our counter. You guys are the only service I will EVER call for transportation. You’re always here so promptly and so professional! 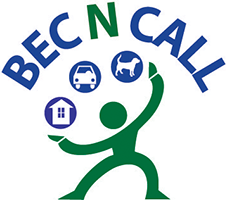 Bec N Call is the only company I know that truly answers the phone 24/7! When I call, they respond. Thank goodness Randy was there to take care of me when I needed to go to the ER. I may not have made it without him. We waited over 4 hours for an ambulance to pick up Mom at the hospital and take her to Rehab, and called Bec N Call and they arrived within 30 minutes. I called for a notary at 10:00pm and Kim was there in 15 minutes. Talk about customer service! I was in the ER and called for a cab. I waited 2 hours for a cab and then called Bec N Call and they were there in 10 minutes! I’ll never call a cab again. Scott was pet sitting for us and we had a water leak in the bathroom. He was so kind to empty all contents from under the counter, call me and clean up the water immediately. He treated our home like his own. My husband saw one of the vans in Dallas and sent me the phone number. I called and spoke to Stephanie who was so kind and answered all of my questions. I knew they would take great care of my mom. We booked 7 trips over the next 2 weeks allowing Mom to leave her assisted living and get out and enjoy life again.